If you are watching or listening to the news at the end of the day you will usually be told what happened to the stock market that day. More precisely, you will be told whether it went up or down in price. Yet investing in shares is not just about changes in prices. When you own a share of a company you are often paid a dividend as well. Dividends can be very important. They can form a major part of any long-term savings plan and also a source of income to live on. In this chapter, we are going to look at why dividends are important and how you can use them to build up your savings pot or as a source of income. Then we will look at some of the tools that SharePad has to help you find some dividend paying shares that can help you meet your goals. Dividends are your share of a company’s after-tax profits paid to you each year. They make up part of the investment return from owning a share. However, unlike a share price that goes up but then goes down again, a dividend once it has been paid cannot be taken away from you. What’s good about dividends is that they represent a real, tangible return on the shares that you own. The same cannot be said for a rising share price. Share prices tend to move up and down a lot and there’s no guarantee that you will sell for a profit. Investing in shares that pay chunky dividends and holding them for a long time can be a great way to build up your portfolio’s value. That’s because the dividend from shares and the reinvestment of them is where the real money can be made from the stock market over the long haul. Why is this? I’ve never been able to find the source, but Albert Einstein was rumoured to have said that “the most powerful force in the world is compound interest”. When it comes to investing – and dividend investing in particular – I’m inclined to agree with him. Compound interest is essentially earning interest on the interest that you’ve already been paid. This is what tends to happen if you leave money in a savings account for a number of years. Let’s say that you put £100 into a savings account that pays interest of 10% per year at the end of the year. You have a choice of what to do with the interest that you receive. You can either spend all or some of it or you can reinvest it. In the first year, you will receive £10 of interest on your £100 of savings. If you spend the interest every year, this is what happens to your interest income and savings over five years. You receive £10 every year to spend and at the end of five years the value of your savings is still £100. You’ve had £50 of interest income and preserved your savings pot. So your initial £100 has given you £150 of value. But what would happen if you didn’t spend the interest and reinvested it back into the savings account at 10%? If you compound the interest you receive. Well, after five years, the value of your £100 would have grown to £161.05 and your annual interest income would have grown to £14.64. The longer you reinvest your income the bigger the potential annual income and the value of your savings pot. This is the power of compound interest at work. The one big caveat here is that the interest rate has stayed the same for five years. This might be the case with a fixed term savings account but is rarely the case for other investments. I’ll say a bit more on the effect of changing interest rates a little later on. You can use this strategy of compounding to very good effect with dividend paying shares. Instead of spending the dividend you receive, you use it to buy more shares in the company which paid you it, which in turn gives you more dividends in the years ahead. Repeat this process for long enough – the longer the better – and it is possible to turn a small initial sum of money into a large one. This can be the case even if dividends per share or the share price do not change. Let me show you how this can work. Let’s say that you buy 1000 shares in a company called Bob’s Book Stores plc at 100p per share (so an investment of £1,000) when it is paying an annual dividend per share of 4p. Over the next thirty years the company doesn’t grow its profits but maintains them. Dividends stay at 4p per share and the share price stays at 100p. If you had kept your 1000 shares you would have received an annual dividend income of £40 (1000 x 4p) or £1200 over thirty years. With your 1000 shares still worth £1000, your investment value would be £2200 (£1,000 + £1,200). But if you had reinvested the dividends and bought extra shares (To keep things simple, I’ve ignored the impact of broking commissions and buying whole shares here) each year you’d have ended up with a much better result. At the end of thirty years you would own 3243 shares worth £3243 and have an annual dividend income of £125. 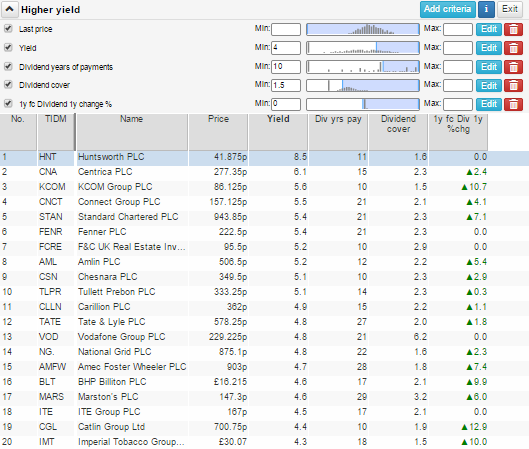 This equates to a yield on initial cost of 12.5% (£125/£1000). That said, if you pick the right investments you’ll find that dividends don’t stay the same for thirty years – they can often increase substantially. This makes dividend reinvestment and the power of compound interest even more attractive – if you can find the right share at the right price. More on this in a short while. It’s worth adding that companies which have an explicit policy of paying and growing dividends (known as a progressive dividend policy) usually aim to increase their payouts by at least inflation. Theory is all well and good, but what about what happens in the real world? The chart on the next page compares the value of the FTSE 100 (the lower or blue line) with the value of the FTSE 100 Total Return index (the higher or orange line), which includes the effect of reinvested dividends, over the last twenty years to January 2015. You can now see that the total return index is worth over twice as much as the FTSE 100 index which in itself has more than doubled. This is important as it should make you look at investment results in a different way. Investing in shares is not just about the changes in share prices. On that basis, you might think that the FTSE 100 index-which has grown at an average of 3.9% over the last 20 years – has been a fairly disappointing investment. However, the point I want to get across is that dividends matter and can make up a large chunk of the returns that you get from owning shares. When you look at the impact of reinvesting dividends, the FTSE 100 total return index has grown at an average rate of 7.5% a year which is a lot more respectable. Buy the right share at the right time and the right price and you can see spectacular results. Take British American Tobacco (LSE:BATS) for example. Let’s say you bought 1,000 shares of this company on the first trading day of 2000 for 332.5p (an investment of £3325 excluding stamp duty and dealing costs) when it was paying an annual dividend of 22.2p (or a dividend yield of 6.7%). The shares were very cheap as many investors ignored them and put their money into glamorous internet shares. Just over fifteen years later though in January 2015, BAT shares are priced at 3522p and are paying an annual dividend of 144.9p. Most people would be quite happy. The shares have soared as has the annual dividend per share. Even if they had spent their annual dividend income, their investment would have increased in value more than ten-fold to £35,220. The dividend income as a percentage of the original price paid (144.9p/332.5p) – or the yield on cost – would be an impressive 43.6%. But say you’d reinvested your dividend income every year and bought more shares with it. Your investment would have soared in value to £69,335 with an annual dividend income of £2753.64 – or a yield on cost of 82.9%. It helps to buy shares at a cheap price. Back in 2000, companies like BAT were out of favour as investors piled into glamorous internet and technology shares. With a dividend yield of 6.7%, the shares looked – and turned out to be – very cheap given that the business was not in trouble and had been increasing its dividend. The importance of dividend growth. Your returns can be turbo-charged if the company is capable of delivering high rates of dividend growth. BAT’s annual dividend growth over the last 15 years has averaged 13.3%. The power of time. The longer you invest for, the greater the power of compounding on your investment returns. I really like this style of investing and use it myself for my share portfolio. What’s particularly good about it is that you focus your attentions on the performance of the company and its ability to keep paying a growing dividend rather than what’s happening to the share price. The bigger the amount of your investment return that comes from dividends and their reinvestment, the less you tend to worry about share prices. In fact, with this investment strategy you can actually welcome falling share prices. As long as the underlying business is sound, a falling share price allows your dividend to buy more new shares which means more dividends to potentially boost your long term returns. With this mindset, you worry less and concentrate on what’s important rather than the short-term whims of the stock market. To me this is proper investing and more people would be better off – financially and emotionally – if they put their money to work this way. This strategy is based on holding on to a share for a long period of time. This is known as a buy and hold strategy. However, this must not be confused with a buy and forget strategy. Whilst you do hear stories of people who had left shares invested and forgotten about them for 30 years, and then to find out they had become millionaires, it is probably wiser to keep an eye on your investment from time to time. I’m not talking about obsessing about share prices every day. Instead you should read the company’s half year and full year results statements to see that all is well and that your dividend is still safe and growing. The other thing to keep an eye on from time to time is the dividend yield on your shares. This is important because it represents the rate of interest you are getting on your reinvested dividends. Back in 2000, the dividend yield on BAT shares was 6.7%. This was the income return you would get by reinvesting the dividend. In January 2015, the dividend yield – and reinvestment rate – has fallen to 4.1%. The rate of dividend growth has also slowed down a lot. This means that the value of an investment in BAT is likely to compound at a much slower rate in the future than it has in the past. What you need to be constantly asking yourself is whether you can reinvest at a higher rate elsewhere? 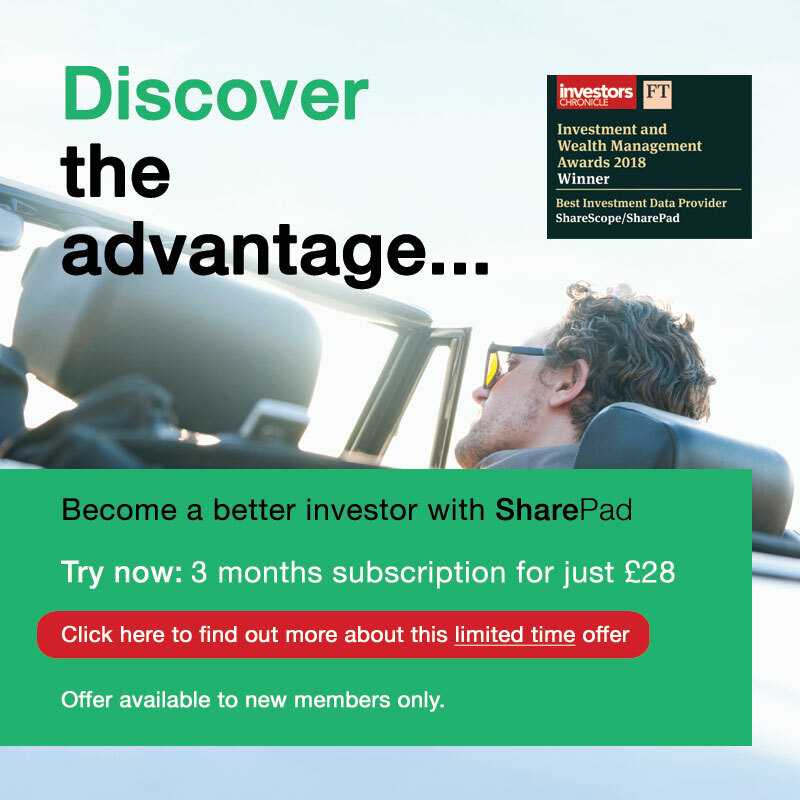 You can search for shares with high dividend yields and dividend growth potential with SharePad. I’ll be showing you how to do this shortly. Reinvesting your dividends is fairly straightforward. With funds (not exchange traded funds or ETFs) you can buy what are known as accumulation units that do this for you. Alternatively you can set up an automatic dividend reinvestment plan for individual shares with your broker (often restricted to shares that are in the FTSE 350 index) who will reinvest dividends for you for a small fee. If you don’t want to reinvest back into the same share (for example if the price has gone up a lot and the dividend yield is too low), you can always just let your dividends increase your cash account over a year and then reinvest the money later on when you find a good dividend paying share at a reasonable price. 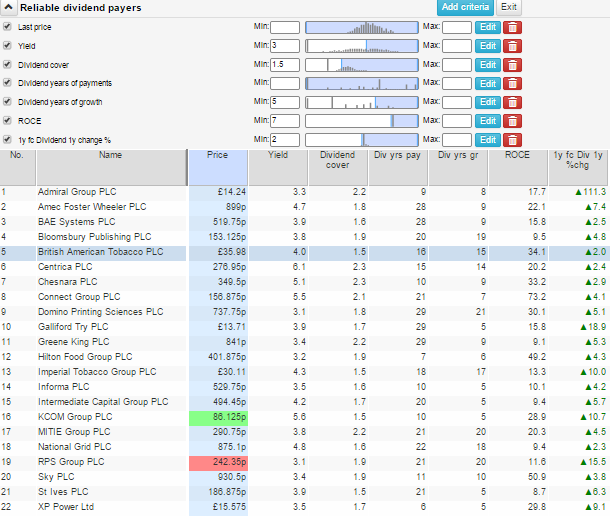 I’m now going to show you how to look for the shares of companies that could be good dividend shares in SharePad. This is fairly easy to do with the filter function and by adding the criteria that you want the shares to match. You can see a filter that I’ve built below. A minimum dividend yield of 3% – I want a reasonable starting dividend return. Minimum dividend cover of 1.5 times – the higher the cover, the better. However, I don’t want to exclude mature industries such as tobacco, telecoms and utilities where dividend cover can be lower but still mean that the dividend can be quite safe. Dividend years of payments – I’ve left this blank, but want to see how many consecutive years a dividend has been paid. This means that companies that have missed a dividend payment – and often do when times get tough – can be excluded from the list of possible investments. Dividend years of growth – If a company has been growing its dividend that’s usually a sign of health. I’ve set this criterion for at least five years. This means that a company will have to have increased its dividend in each of the last five years. A minimum return on capital employed (ROCE) of 10% – This would indicate that the company concerned is a reasonable business and can earn respectable returns on the money it invests, which in turn suggests that it can keep on paying a dividend. Forecast dividend growth greater than the rate of inflation – I’ve set a minimum growth rate of 2% so that the dividend increases in value after inflation. Additionally, I would also look at the levels of debt and interest cover of a company as well. High debt levels and low interest cover can often see a dividend cut if profits fall. This has produced a list of 22 shares to look at more closely. Just as an example I might start by looking at the following five shares as possible investments. I’ve chosen these companies because they offer reasonable yields, have an excellent track record of increasing their dividends and are predicted to offer a decent dividend growth. The temptation when you find shares that look interesting based on their numbers is to rush in and buy them. This can often be a mistake. Take your time and do your homework. Study the company’s financial history, read the latest news, check that the directors own a decent chunk of shares and look at the recent share price performance. This should be seen as the bare minimum amount of research that you should do. Following a disciplined approach means that you can learn a great deal about a company. I also like to read the front half of the company’s annual report which gives a flavour of the company and its short- and longer-term objectives. You won’t know everything – no outside investor ever does – but you should have enough information to know what you are buying and why. The real skill in investing often rests with having the patience to wait and pay the right price. Even before interest rates on savings accounts and government bonds fell to their current low levels, investors have been using dividend income from shares as a source of income to live on – especially in retirement. With pensioners no longer seeing annuities (where you hand over money to an insurance company in return for an income for the rest of your life) as the best source of income, it is likely that dividends from shares will become a more popular choice. If you are looking for dividend income to supplement your pension, then you can look for shares that might help you to do that in SharePad. Again, I’ve used the filter function in SharePad to do this. The criteria you choose for your filter are up to you. I’ve chosen slightly different criteria to my previous dividend growth filter. A minimum dividend yield of 4% – The yield needs to be sufficiently high to provide a reasonable amount of income. Dividend cover of at least 1.5 times – so reasonably covered by profit. Continuous dividend payments for at least ten years. I want some comfort that the company has been able to pay some dividend when times have been tough. This gives me some confidence that it might be able to weather economic storms in the future. Minimum forecast dividend growth of zero. I am looking for the dividend to be at least maintained at its current level. This gives me a list of twenty shares to research further. Five shares that I might consider looking at based on their yields, dividend history and potential dividend growth are in the table below.